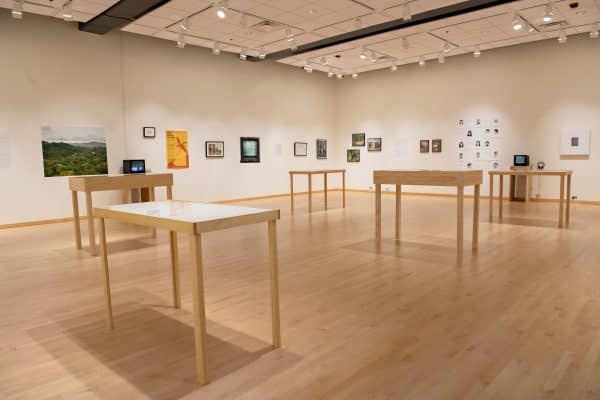 Washington and Lee University’s studio art majors will present their senior projects in an exhibition that opens in Staniar Gallery’s and Wilson Hall’s second-floor art display spaces on March 26. The show will be on display through April 6 with an opening reception for the artists in Lykes Atrium, Wilson Hall on March 28 at 4:30 p.m.
Each spring, Staniar Gallery showcases work by the Art Department’s graduating studio majors in a senior thesis exhibition. The year-long thesis project gives the students the experience of creating a cohesive body of work and the opportunity to exhibit in a professional gallery space. The group show displays accomplished artwork in a variety of media including drawing, installation, painting, photography, sound and video. This year’s show features work by Ryan Brink, Audrey Dangler, Sara Dotterer, Jessie Drennen, Ellen Kanzinger, Leigh Poetzsch, Hayley Price, McKenna Quatro, Ruth Smith and Amberly Wang. Staniar Gallery is located on the second floor of Wilson Hall, in Washington and Lee University’s Lenfest Center for the Arts. Gallery hours are Monday through Friday, 9 a.m. – 5 p.m. For more information, call 540-458-8861.